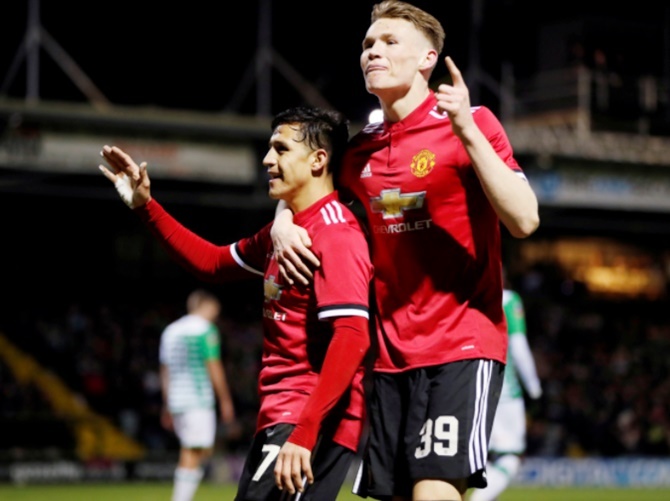 Debutant Alexis Sanchez had little trouble adjusting to his new place in Manchester United's line-up as he assisted the opening two goals in the Premier League club's 4-0 FA Cup fourth round win at Yeovil Town on Friday. Marcus Rashford and Ander Herrera both benefited from the Chilean's presence either side of halftime, while Jesse Lingard and Romelu Lukaku scored late on as the 12-times FA Cup champions overcame a spirited performance from the League Two hosts. The Portuguese coach, who previously criticised his side for their lack of intensity in falling to lower league side Bristol City in the League Cup last month, this time hailed his side's 'correct attitude' and singled out the maturity of his new signing in particular. "Everybody is happy that he (Sanchez) comes because good players want good players and Alexis is a fantastic player for us," Mourinho told the BBC. "And the question as well is which one is going to be axed, where is he going to play – it is not about that for us. For us it is the fact that we have a fantastic group of attacking players and he's another one with a bit more maturity, more experience." Sanchez's replacement Lingard continued his recent fine run of form by running into the opposition penalty area late on and firing in his 12th goal of the season in all competitions. Lukaku then grabbed his third goal of 2018 with a close finish to cap a flattering win for Mourinho's men.